Everything shown here are actual film-used props from the 1997 film STARSHIP TROOPERS. The contents of TrooperPX is part of a single private collection. None of these items are for sale. This exclusive information brought to you by TrooperPX. 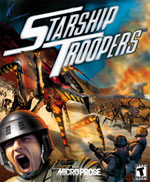 Here you will find archived, information on the Starship Troopers CD-ROM video game as it became available. Choose a link below to jump to your area of interest. I have included as many articles as I could find and screen captures from other sources. These pages have been updated with more screen captures, reviews and articles. Thank you for your interest and support with this project. Special thanks to Darren from HIUK and Andrew from Blue Tongue Software. Which cover did you like? Shortly after the game was released, the official ST:TA site was flooded with requests for a "patch". Apparently the game is only compatible with the "latest" hardware, and other systems may-will-did run into playability issues. The staff monitoring the official ST:TA was unprepared for the high volume of tech support being requested, and HIUK decided it would be better if they just didn't deal with the problem. Several fans of the game attempted to create their own patch and offer tech support amongst them selves. KD was able to post a patch that his team developed on their own, which turned out to help a large number of people. Thank you. However, shortly after that, HIUK pulled all support, including the official website for ST:TA. Also interesting is that you will not find this game listed in any of their own advertising or promotion. 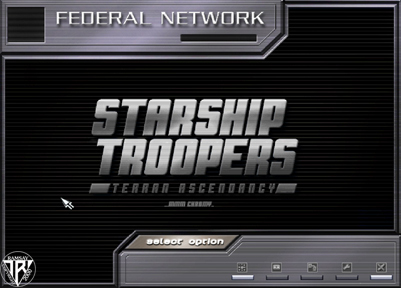 This is sad because it really is a cool game, fun to play, with graphics that bring Starship Troopers to life. Thanks goes to Blue Tongue... they did some wonderful work. This site remains the single largest reference to their hard work. It will always be here. Copyright © 1998~2002 David Ramsay, All rights reserved. No images may be captured, copied, reproduced or used without permission.